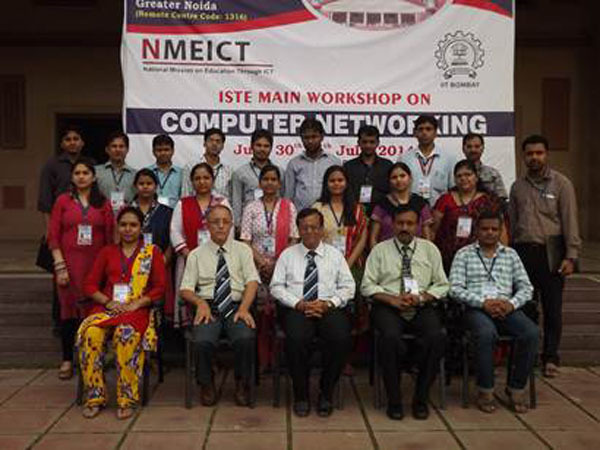 A one week ISTE Main Workshop on “Computer Networking” was organized at Dronacharya Group of Institutions, Greater Noida, which was conducted by Indian Institute of Technology, Bombay under the National Mission on Education through ICT from June 30th to 5th July 2014. 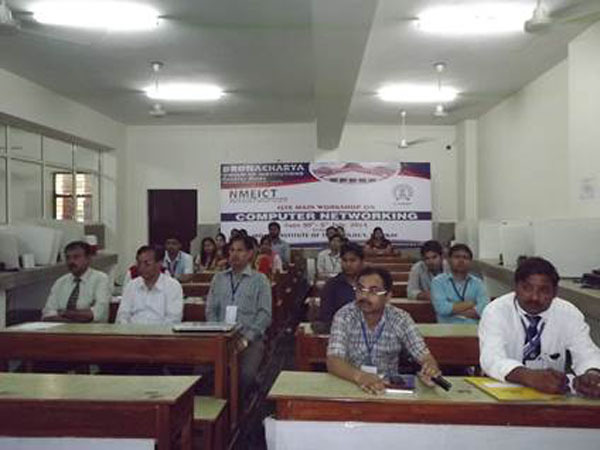 Mr. Manoj Kumar Yadav, Assistant Professor, Department of Computer Science & Engineering was the workshop coordinator. 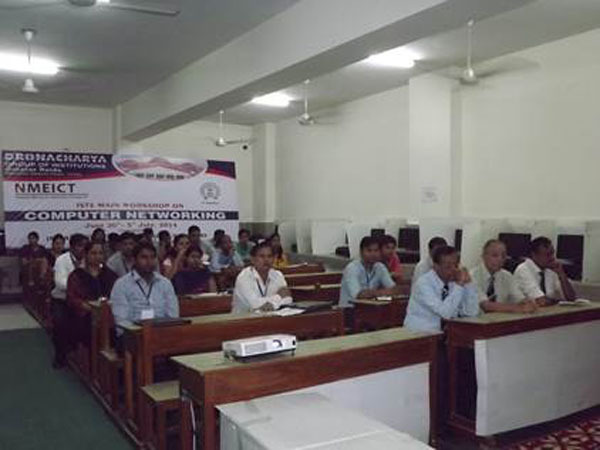 26 faculty members from different institutes attended this workshop. 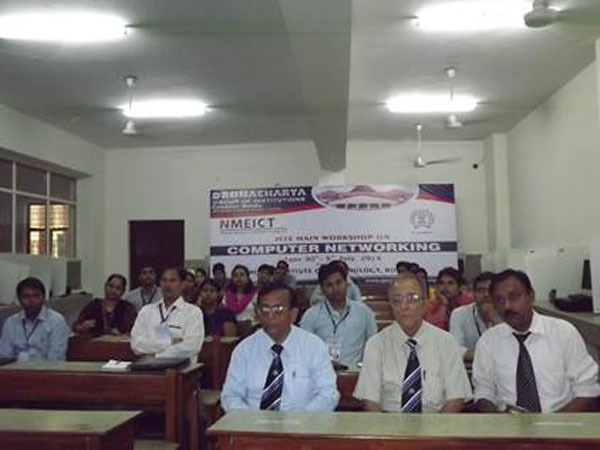 The workshop was inaugurated on June 30th 2014 by Project Coordinator, Prof. Deepak B. Phatak, Dept. of Computer Science & Engineering, Indian Institute of Technology Bombay. In his inaugural speech he explained the mission and objectives of the workshop and he appreciated Prof. Kameshwari Chebrolu (Dept. of Computer Science & Engineering, Indian Institute of Technology Bombay) for her outstanding active learning approach and her devotion to conduct this workshop successfully. The workshop overview and an interactive session were delivered by Prof. Kameswari. During the post lunch session, the hands on experiments were started to get the participants acquainted with some commonly used networking commands and TCP/IP diagnostic tools. The participants were able to understand the concept of layering/encapsulation by looking at Link, IP and TCP headers. Further experiments helped them to understand the concept of multiplexing using Ethernet "frame type" field, IP "protocol field" and Transport "port number" field. On the second day of the workshop, the technical session delivered by Prof. Bhaskaran Raman, Dept. of Computer Science & Engineering, Indian Institute of Technology Bombay focused on handling student's projects. He enlightened to the participants on the various types of networking projects like Network simulation based, Socket Programming etc. The session was followed by Lab session-II with the objective of exploring some more Demultiplexing and to understand the operations of ARP (Address Resolution Protocol). On the third day of the workshop, Prof. Kameswari started the first technical session with the introduction of “flipping the classroom experience”. She explained the merits and demerits of flipping class paradigm. In the post break session, Prof. Kameshwari briefed about the lab session. 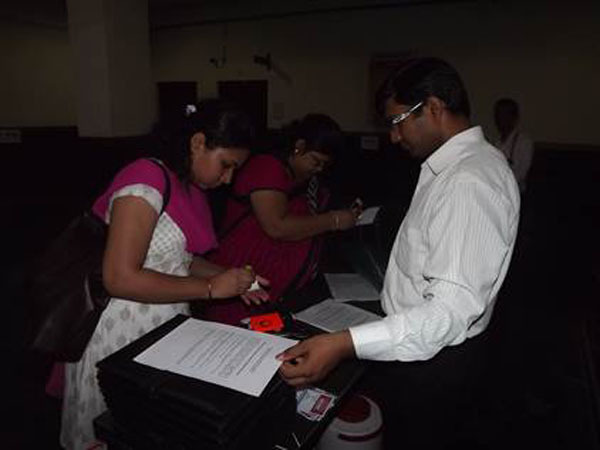 All participants successfully completed the allocated lab assignments. The lab session-III was organized with the objective of understanding the operation of various mechanisms/protocols that operate at network layer including IP fragmentation, DHCP and ICMP. On the fourth day of the workshop, Prof. Sridhar Iyer, Dept. of Computer Science and Engineering, IDP in Educational Technology, IIT Bombay delivered a session on “Teaching pedagogy for effective learning”. He explained the “Think Pair Share technology” which is an active learning strategy. During his session, he gave an online task to all the participants to elaborate the Think Pair Share technology. During the post lunch session, the participants underwent lab session-IV with the objective to get familiarized with NS2 simulator and to understand popular performance metrics like throughput and loss. Commencing the fifth day of the workshop, Prof. Iyer delivered a session on “Teaching Pedagogy for Effective Learning” and discussed the flipped classroom technique in detail. He explained that the flipped classroom is a reversal of traditional teaching where students gain first exposure to new material outside of class, usually via reading or lecture videos, and then class time is used to do the harder work of assimilating that knowledge through strategies such as problem-solving, discussion or debates. The question answer session then started, and some of the participants from different remote centers asked questions related to think Pair Share. Then Prof. Kameshwari discussed about Socket Programming, After the post lunch, the participants worked on client server programming (socket Programming). On the last day of workshop, Prof. Kameshwari delivered a technical session on “Future Trends in Computer Networks” and discussed on the various layers of the TCP/IP model. She further explained about the current research areas in the field of Computer Networking. The session was followed by “Workshop Feedback and Valedictory Function” and participants from the different RC's provided their feedback about the workshop. 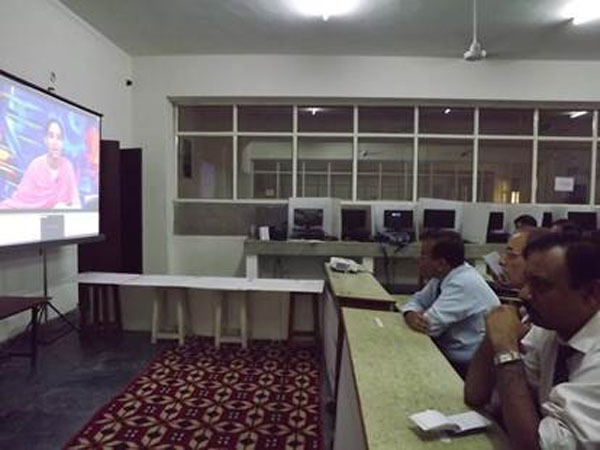 Then Prof. Phathak and Prof. Kannan joined Prof. Kameshwari and Prof. Phathak interacted with the remote centres. Prof. Kannan said the objective of the workshop was to provide platform for the empowerment of teachers by providing excellent course content and teaching methodology, and wished that the objective is met. The workshop was a pleasant learning experience and provided a concrete platform for the professionals and academicians across the India to discuss relevant challenges of networking affecting global society and their solutions.